Best of Houston: Sweet Treats! HOUSTON- If you are on a diet, this article is not meant for you. Whether you prefer a pastry, cupcake, apple pie, or just anything with sugar; Houston has some of the best bakeries and dessert shops to satisfy any sweet tooth. The Dessert Gallery Bakery and Café offers a little bit of everything. Since 1995, this bakery has been making homemade cakes and desserts. They are known for their delicious cakes which include Carrot, German Chocolate, Coconut Cream, Strawberry, Red Velvet and more. You can come in for just a slice or order any size. They also offer pies, brownie pops, macaroons, and more! Hours: Monday-Thursday, 11 a.m. to 10 p.m.; Friday-Saturday, 11 a.m. to midnight; Sunday, 12 p.m. to 10 p.m.
As one of Houston’s original bakeries, Moeller’s Bakery is known for its cakes and small sweet treats. It has been around since 1930 and all of their desserts are made from scratch. Be sure to try their petit fours and iced cookies! Hours: Monday-Friday, 6:30 a.m. to 6:30 p.m.; Saturday, 7 a.m. to 5 p.m. Located in Historic Third Ward, this bakery prides itself in making homemade goodies such as peach cobbler, banana pudding and sweet potato pies. In addition to these goodies, they are known for their cakes, cookies, cake pops and cake balls. Their motto is “There’s goodness in every bite,” and their customers would agree! Hours: Tuesday-Friday, 9 a.m. to 6 p.m.; Saturday, 8 a.m. to 3 p.m.
No, you don’t have to be over 21 to come here. The Chocolate Bar offers any and everything made from chocolate that you can possibly imagine. Their menu includes chocolate candies, chocolate drinks, chocolate ice cream, chocolate cake and the list goes on. Located in Rice Village and River Oaks, this bar is the perfect place for any chocolate fix! Hours: Monday-Thursday, 10 a.m. to 10 p.m.; Friday to Saturday, 10 a.m. to Midnight; Sunday, 12 p.m. to 10 p.m. If you love a cupcake, then you have to check out Crave Cupcakes located in Rice Village, Uptown Park and The Woodlands. 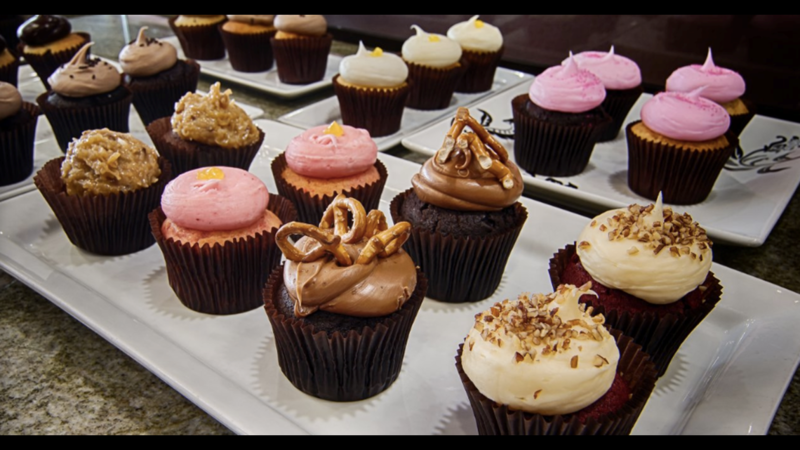 The cupcake shop offers a variety of flavors such as: Red Velvet, Key Lime, Italian Crème, Strawberry, German Chocolate and more. The bakery was started by Texas natives and prides itself in using premium ingredients to make what many say is the best cupcake in the city! Hours: Monday-Friday, 8 a.m. to 8 p.m.; Saturday, 9 a.m. to 8 p.m.; Sunday 10 a.m. to 7 p.m. If you’ve never had authentic South American pastries, you should definitely try Sweets by Belen. The owner, Belen Bailey, is a native of Peru and has been creating desserts for years in honor of her mother and grandmother. She creates various sweets from her family’s recipes including Dulce de Leche Rolls, Torta Helada, Tres Leches, fruit tarts, sandwich cookies and more! Hours: Monday, 12 p.m. to 6:30 p.m.; Tuesday-Thursday, 11 a.m. to 6 p.m.; Friday-Saturday, 11 a.m. to 7 p.m.; Sunday, 11 a.m. to 5 p.m. Many customers claim El Bolillo to be the best Mexican bakery in the city. It started as a small bakery in the Heights and has since expanded. They are known for their fresh bread, pastries and desserts which include a variety of Tres Leches cakes, cinnamon rolls, cookies, muffins, donuts and more! Hours: Monday-Saturday, 5 a.m. to 10 p.m.; Sunday 6 a.m. to 10 p.m. Located in the heart of River Oaks, Epicure Café is a favorite among many Houstonians who enjoy bistro-style cafes with delicious pastries and sweets. The café also offers homemade ice cream and sorbet. Pastries include éclairs, pistachio cake, apple strudels, peach tarts, and more. The café is a perfect place to meet up with friends for a sweet treat! Hours: Monday-Thursday, 8 a.m. to 8 p.m.; Friday-Saturday, 8 a.m. to 10:30 p.m., Sunday, 10 a.m. to 7 p.m.
Who doesn’t love bite-size cupcakes? SMALLCAKES offers you just that! Every morning the cupcakery bakes and frosts 18 signature flavors. Flavors include your more traditional chocolate and vanilla, but also specialty flavors like Caramel Crunch, Cookies-n-Cream, Peanut Butter Cup and more. With location across Texas and the nation, this cupcake chain has perfected their recipes that don’t disappoint! Hours: Monday-Saturday, 10 a.m. to 8 p.m.; Sunday, 12 p.m. to 5 p.m.
House of Pies is a Houston staple. For over 50 years, this restaurant is a trusted source for a great pie no matter the time of day. Known for offering a “Slice of Heaven on Earth,” the restaurant offers a variety of homemade pies including fruit pies, meringue pies, cream pies, cheesecakes and more. It is also a popular late night eatery with it being open 24 hours a day and 7 days a week. If you love a good pie, then you should definitely pay them a visit! If you want in house baked goods using quality products, check out Suzybees Bakery. The bakery specializes in custom cakes, sugar cookies and other treats. They also have a variety of baked goods available daily. Their pastry chef and co-owner Caty Johnston is a classically trained. After graduating at the top of her class, Caty learned to decorate cakes from the bakery's original owner and developed her passion of all things sweet. The bakery is family owned and operated! Hours: Tuesday-Friday, 11 a.m. to 7 p.m.; Saturday, 10 a.m. to 6 p.m.
With three locations in the Houston area, Three Brothers Bakery claims to be one of the best bakeries in the city that prides itself in being “memory makers who happen to be bakers.” The bakery has a deep history starting back in Poland and continues to be family-owned and managed. They are known for making delicious European-style breads and pastries. They offer everything from cookies to birthday cakes!